Billy started out as a schoolboy in the Rotherham Academy, but elected to join his home town side of Sheffield United at the age of 16. The young striker made two substitute appearances for the Blades, but didn’t really feature in Neil Warnock’s plans, and came to Diamonds on 21 January 2005 on an initial one month loan deal. After scoring two goals in five games, his loan period was extended to three months. His time at Diamonds will be fondly remembered not only for the 9 goals in just 16 appearances, but for the late winner in the crunch derby match against Northampton Town. In March 2005. His valuable goals saw Diamonds avoid relegation that season. He returned to Sheffield United on 24 April 2005, but a £100,000 transfer deal with Scunthorpe United in August saw him move to the League One side. His goalscoring continued unabated with 56 goals in 95 games over two seasons which culminated in the clubs promotion to the Championship. With a number of clubs showing interest, he rejoined his beloved Sheffield United on 4 July 2007 for a £1,5m fee, but his form dipped again. During September 2009, he went on a season long loan to fellow Championship sideDoncaster Rovers. After returning to the Blades at the end of the season, offers of around £1m from Rovers and Burnley were both rejected before an improved offer of around £1.1m was agreed for a three year deal with Doncaster Rovers. During January 2012, Billy rejected a proposed move to Leicester City, but eventually agreed a 3½ year deal to join Championship side Southampton on 30 January 2012 for an undisclosed sum, allegedly around £1.8m. 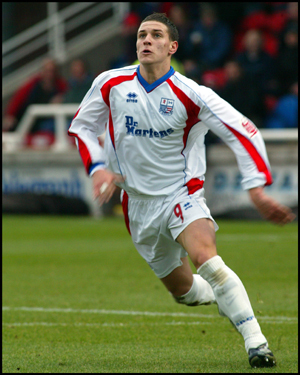 During his spell at Doncaster, he made 86 appearances, scoring 41 goals. He made his Premier League Debut, for Southampton, in August 2012. After a single season where he scored 10 goals in 18 games, Billy joined Championship side Nottingham Forest on a season long loan on 31 August 2012, with a possibility of a permanent move at the end of the season, but with a further two years left on his contract, he returned to Southampton after 31 appearances for Forest, and 11 goals. After being frozen out of the First Team squad at the start of the 2013/2014 season, Billy joined Championship side Reading on a loan deal commencing 26 September 2013 until 1 January 2014. He scored 2 goals in 10 appearances for the Royals before returning to the Saints. On 22 January 2014, Billy joined Championship side Doncaster Rovers on another loan deal until the end of the season. With a year still left on his contract, Billy was transferred to Championship side Leeds United on 13 August 2014 on a two year deal for an undisclosed fee. In July 2015 he returned to Sheffield United, helping them to win promotion back to the Championship. His Wikipedia entry is here.